A bit late with this, as Seville’s annual religious extravaganza finished ten days ago, but better late than never. For those who don’t know, Semana Santa (Holy Week) is one of the world’s most important religious festivals, and the celebrations in Seville are probably the biggest and most fervent in Spain, drawing visitors from all over the country and from abroad. During the course of the week, from Palm Sunday to Easter Sunday, more than forty processions make their way from their home churches and along the sacred way to be blessed in the Cathedral before returning home, some of them taking up to 12 hours for the round trip. Each procession consists of (usually) two “pasos”, or floats, one with a statue of the Christ, the second with the Virgin, which are carried aloft by teams of men (costaleros) concealed beneath them, that are accompanied by brass bands and the penitentes (the guys with the pointy hoods, which are worn to preserve anonymity), and even for the non religious the overall effect is quite moving, with the statues swaying above the crowds as they make their way along their assigned routes. Although it has changed a lot over the centuries, with the modern version developing in the 19th century, the roots of the festival go back to the mediaeval guilds and “self-help” religious brotherhoods, and these have long inspired considerable devotions. Some of the statues are of great age and artistic importance, the floats ornate, guilded, and in the case of the Virgins canopied and bedecked with flowers. Definitely worth experiencing at least once, as there’s nothing quite like it anywhere else. I’ve said it before, but I’ll say it again – Seville is big on Virgins. And on August 15 it’s the turn of Seville’s very own Our Lady the Virgin of the Kings, the official patroness of the city. The stories of the origins of the image, whose actual sculptor is unknown, are a mix of history and legend. According to some she was carved by the angels and after being found by Ferdinand III, accompanied him throughout the reconquest of this part of Spain from the Moors. More prosaically, it is said that the king saw her in a vision, and that the image was made on his orders. Another story is that she was a gift from Ferdinand’s cousin, Louis IX of France. Since the 16th century she has “lived” in the Royal Chapel in the Cathedral. The celebrations officially extend from August 4 to 22, with special services in the cathedral and viewing of the Virgin, but the highlight is the triumphal procession on August 15, the day of the Ascension of the Virgin Mary. The route is short, the procession leaving the cathedral by the gate in the plaza, and doing a single anti-clockwise circuit of the cathedral before entering again by the same gate. It starts early, too, at around 8am, but it’s worth missing your lie-in to go and watch. The procession is accompanied by many local church and civic dignitaries, a brass band, the pealing of the church bells, and large crowds in the square and surrounding streets. Nowhere does religious processions better than Seville, and the procession of the city’s patron Saint is no exception. Although Father Christmas/Santa Claus has been gaining ground in recent years, in the south of Europe, and particularly the Spanish speaking world, the bringer-of-gifts is a much older figure, or more properly some much older figures, as there are three of them – the Three Wise Men of Biblical tradition, now more popularly known as Los Reyes Magos, the Magic Kings (Magos can be translated as either wizard or wise, and given that they “followed a star” they were probably astrologers). Although unnamed in the Bible, they have been popularly known since times immemorial as Melchior, Gaspar and Baltasar, and, despite the Pope’s recent assertion that they were Spanish, every Spanish child knows that they actually come one from each of the three continents, Melchior from Europe, Gaspar from Asia and Baltasar from Africa (no America or Australia in those days). They don’t come at Christmas either, but on Epiphany, January 6, at the end of the holiday period, and they travel by camel, but they do visit every house in a single night. In the days before Reyes children must write a letter to the kings, so that they know what presents are to be delivered, but if they’ve been bad they may find that their only present is a lump of coal. In Seville (and many other places in Spain) there is a big parade, the Cabalgata (cavalcade) de los Reyes during the afternoon and evening of January 5, and large crowds line the streets to watch the parade go by. The unique feature of these processions are the sweets that are thrown into the crowds for the children to pick up. One last tradition is the food. Roscón de Reyes, made almost everywhere in the Spanish speaking world as part of the celebration of the Three Kings, is like a large doughnut with candied fruit (and these days, chocolate). It is common for these (if home-made) to contain “surprises”, small items for the children to find when the cake is eaten. The Velá de Triana, or Velá de Santiago y Santa Ana to give it its full and correct title, is a traditional market fair that dates back to the 13th century, and is Triana’s largest annual street party. It’s held in late July, (this year July 20-July 26) and draws large crowds from all over the city. There’s a stage for concerts in the Plaza del Altozano, local associations and hermandades set up booths and stalls along Calle Betis, and there is a small funfair for children towards the San Telmo Bridge, There are lots of activities during the week, including concerts, rowing and fishing competitions, an exhibition of old photographs in the Castillo San Jorge, and the Cucaña (which I finally saw for the first time this year), where the contestants (mostly young men, but some women, too) get a chance to show off by snatching a flag from the end of a greasy pole projecting over the river. It’s a great way to spend a summer evening or two, strolling beside the booths, drinking beer or a sherry, and sampling the pescaito frito (fried fish) and green hazelnuts. 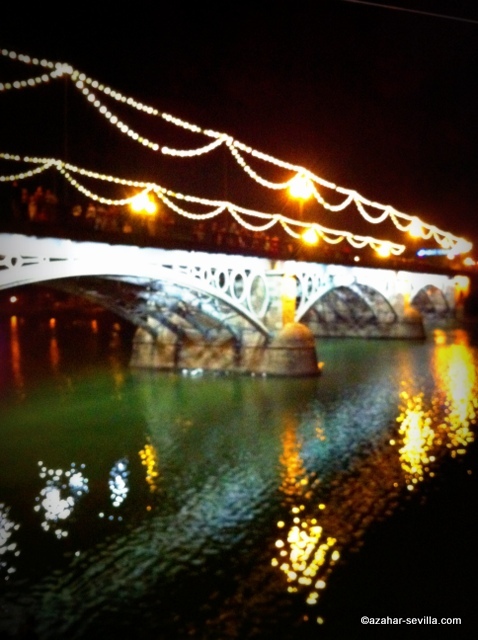 The alumbrado, the switching on of the lights on Triana Bridge, took place at midnight on the Friday, and this year the festival ends with a flamenco performance in the Plaza del Altozano at 10.30 on Thursday evening. Maybe see you there?